Czech Radio´s interesting and valuable project presented under the title Historic Organs of Bohemia and Moravia is already running for a number of years, involving me in a collaboration I am immensely appreciating. Works recorded there in my interpretation have been featured several times over the last few years in Czech Radio Channel 3 broadcasts, often generating feedback in the form of positive and objective evaluations from radio listeners, a fact which I find pleasing and regard as a source of encouragement for my future work. I believe these recordings are highly interesting – due to the qualities, historic, sonority and otherwise, of the historical instruments involved – to merit presentation on compact disc, a medium which can open up broader perspectives for their becoming known beyond this country´s borders. The repertoire offered here has been chosen to suit the parameters of these organs, and includes a few truly rare titles as well as several Czech and world´ s premieres. 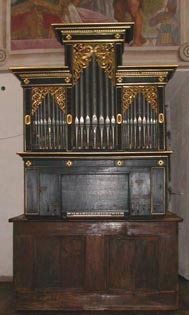 The organ in the castle chapel in Jindřichův Hradec was probably built by the Horák family organ workshop in Dačice, southern Bohemia. Its original location was in the choir loft of Jemčina château. More detailed information about this remarkable two-manual organ is currently unavailable; with a fair degree of probability, however, its origin may be dated back to the second third of the 18th century. This organ represents an important chapel instrument from a valuable collection of the bohemian castles. The organ in the Baptismal Chapel of the deanery parish church in Polná near Jihlava ranks among the oldest surviving examples of the art of organ-building in Bohemia and Moravia. It was built in 1656 by the organ builder Joannes Effnert of Třebíč, and it now seems unlikely that its original location will ever be determined. At some point during the 18th century it was installed in the lateral gallery of the church in Polná, which was then being used as a singers' loft by the local choral and literary society. It was restored by Rudolf Valenta between 2002 and 2004, whereupon a decision was taken to relocate it to the church´s newly instituted Baptismal Chapel, where it has since been used for liturgical purposes as well as for concert productions. The organ of St. Wenceslas´ Church, Netolice is an exquisite example of the work of organ builder Václav Pantoček from Dačice, southern Bohemia. The exact year of its construction is still a subject of debate among experts, as even records in otherwise reliable sources differ here, a confusion which can probably be attributed to the organ´s removal from its original location in the municipal parish Church of the Assumption of Our Lady. The most frequently mentioned dates are 1724, 1726 and 1733.